Gov. Phil Murphy, a pro-marijuana Democrat, has said he wants a legalization bill to be sent to his desk before year-end, although he hasn’t yet committed to supporting this particular version. New Jersey would become the first state to legalize a full-fledged recreational marijuana industry via the Legislature. In January, Vermont was the first to legalize adult use via the Legislature of the possession and use of recreational cannabis. Set up a Cannabis Control Commission that would issue marijuana licenses based on market demand. Tax cannabis sales at 12% at the state level and would allow local governments to apply a 2% tax. Permit retail stores to create separate cannabis consumption areas, if local authorities approve. Set up programs to support minority-owned and female-owned MJ businesses, as well as small businesses. Allow local jurisdictions to ban MJ businesses. 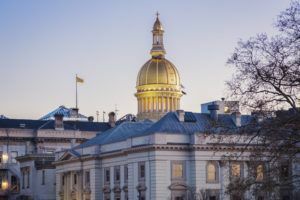 The votes by the Senate budget committee and Assembly budget and appropriations committee came after a monthslong delay in the legalization effort. Sen. Stephen Sweeney, a supporter, said he is still fighting for the cannabis tax rate to be lower because of concerns New Jersey’s black market otherwise would continue to thrive. Laurent Crenshaw, senior director of government affairs of Eaze, a marijuana delivery platform, said permitting deliveries would address the concern of access for residents of communities that don’t want retail stores within their boundaries. Tax it at the regular state tax, same as alcohol. Don’t worry NJ, you will make plenty of tax revenue. Also lower taxes mean price to consumers will be less, which makes legit retailers better able to compete with the black market. What about growing your own ?? I don’t see anything in this story regarding this IMPORTANT Issue! Problem #1 the extra moneys get approved to “Mitigate the negative effects”, there are negative effects????? is this an opioid????? stop it. Problem # 2 the state earmarks the money to local law enforcement at do the mitigating, and they continue to harrass people until the courts tell them to stop. and the beat goes on.